Triple Play! Virginia Right! 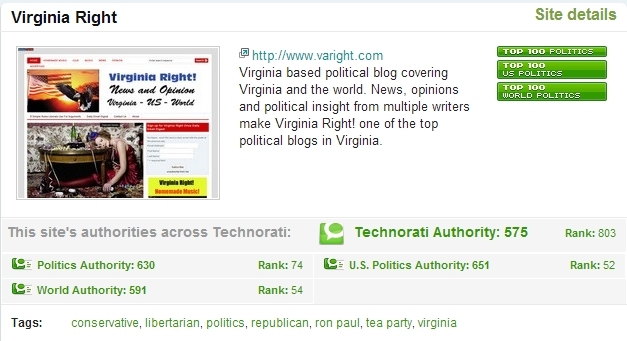 Reaches Technorati Top 100 in Politics, US Politics and World Politics | Virginia Right! We would like to thank the readers of Virginia Right! for consistently keeping this blog in the top 100 categories at Technorati! Virginia Right! is presently ranked #74 in politics in general, #52 in US Politics and #54 in World Politics. And once again, I must give Sandy Sanders the credit for the World Politics ranking. Sandy has a knack for finding the pulse of world political hot potatoes and driving a heck of a lot of international traffic to Virginia Right! Virginia Right! was born on April 1, 2009 (although the concept was hatched November 5th, 2008 – thanks Obama!). In less than 4 years, we have made a mark on the political dialog in Virginia, the US and Internationally. And if you want to know the truth, it is not because Sandy Sanders or Tom White or the others that have occasionally graced the pages of this blog are exceptional people. It is not because we are smarter than anyone else and it is not because we are better than anyone else on the side of America, the Constitution and all that is good and right in this world. It is because we dare to speak out. Because we dare to engage. Because we dare to be the Conservative voice in a sea of fiscal and social insanity. Yep. They are all ahead of Virginia Right! But what this should say to every person that takes a few minutes out of their day to read this blog, our Daily Email or our Facebook Page is that anyone (and everyone) can make a difference. I’ll say it again as I have said in the past. I am nobody special. I am simply a Conservative, a Christian and a family man. And not necessarily in that order. And the only thing that these rankings prove are that any ordinary person (or persons) can make a difference. All you have to do is try. It takes a love of country, and a commitment of of time. And a resolve that the people we elect work for us – we are not their subjects! This goes for Barack Obama all the way to the local dog catcher. Claim your country, find your voice. Be it a blog, Facebook, or simply talking to your family or neighbors. We are all part of the battle to take this nation back from those who want to turn us into a Socialist European failure. Technorati is a yardstick. A measure that gives instant feedback on how effective our efforts at Virginia Right! are. You may or may not have any such measure, but that is not required to make a difference. Just do something. We are in a complete breakdown and effort for the cause makes headway. If Virginia Right! can move into the top 100 – or top 50-ish – in less than 4 years, take heart. ← Are Democrats Prepared To Cut Waste? Lol. I must return thanks to Tom white for taking a chance with an unknown guy to blog for him! It is a great honor to be affiliated with such a blog as VA Right and such a person as Tom White! Congradulations on the Virginia Right ratings. Virginia Right is doing a great job with articles on Politics. Keep doing the same.